Continuous improvement is an organized approach to identifying opportunities for improvement that can help an organization meet its goals for increasing profits, reducing costs, and accelerating innovation. The approach is also used to enhance the quality of a product or service, and to improve safety. Continuous improvement is often part of a specific methodology such as Lean, TPS, Kaizen, Kanban, or Six Sigma, though this is not always the case. The foundation of continuous improvement is a cycle of capturing opportunities for improvement, implementing them, measuring the impact, and sharing the knowledge. With time and dedication, that cycle becomes self-sustaining as success inspires greater engagement, and a culture of continuous improvement spreads throughout an organization touching every process. The company’s strategic goals should guide decisions about which areas for improvement will be addressed and how resources will be allocated. Once those strategic goals are identified, they must be communicated to all levels of the organization. Every employee should be empowered to identify and implement improvements targeting these goals. It is important that continuous improvement results in a measurable ROI. This means that key performance indicators for each target opportunity should be identified early so that the end result can be assessed. Examples of key performance indicators include reduced waste, lowered costs, enhanced customer satisfaction, improved safety, and upgraded product quality. A key goal for a continuous improvement program should be to bring new ideas to old ways of doing things. Sometimes a process can be tweaked to gain improvement, other times it may need to be entirely re-imagined or even eliminated. Continuous improvement opens the door to novel approaches that spur innovation. Before a process or condition can be improved, the current state must be understood. Thus, the first step in continuous improvement is identifying and capturing opportunities for improvement. These opportunities should come from across your organization - particularly from the front lines, as these are the people doing the work and are therefore most qualified to improve it. You should have a standard method for capturing improvement at all levels, including daily improvements as well as those relating to your larger strategic projects and rapid improvement events. Tracking where opportunities are coming from helps you capture the pulse of your improvement culture and determine how far your improvement methodology has spread. Continuous improvement requires that once an opportunity for improvement is identified, it is prioritized and resources are allocated to instigate change. Often cross-functional teams are involved to maximize the positive impact of improvement across the organization. Organizations with a successful culture of continuous improvement implement at least 80% of the ideas that their staff identifies. This isn't to say that the ideas they get are better than those in an organization with a lower implementation rate, but rather, that they work to find an implementable solution to every opportunity that is identified. Sometimes that required providing additional coaching to staff, encouraging them to identify simpler solutions to the problems they've discovered. Tracking your implementation rate is key to establishing a sustainable improvement culture, as it allows you to evaluate and adjust frequently to meet the changing patterns of your organization. 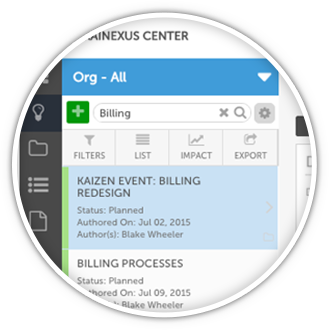 An important aspect of continuous improvement is documentation of results and ROI. An improvement is complete or an issue resolved only when the target KPIs have been achieved and a record of the change has been made. This documentation makes it possible to apply the principles and, sometimes even tactics that were successful in one situation to others, accelerating the pace of future innovation. Understanding the impact of their improvements is vital for engaging employees in the process. It shows them that even the smallest, most incremental changes are worthwhile - a concept that also applies to sharing reports with senior leaders who also need to buy into continuous improvement. Other important metrics are your engagement and activity levels, as these show the depth and breadth of your improvement culture. This allows you to identify bottlenecks to the improvement process before they impede progress, giving you time to coach and adjust as needed. Once an improvement has progressed through the first three stages of the improvement cycle, the results and impact must then be shared across the organization. This has many benefits, the most important of which is that such sharing gives each improvement the maximum impact. Ideas implemented in one part of the organization can be applied throughout, compounding their impact and ensuring that everyone is aware of the latest best practices. Your improvements should be logged in a software solution that creates a searchable knowledge repository so that the information is preserved beyond the period of the initial improvement and sharing. This way, people will understand in the future the origins of current best practices and be able to solve problems by doing a quick search of improvements from across the organization. Continuous improvement software provides a standard way to capture opportunities for improvement from across the organization, from small daily improvements and "Just Do Its" to those that are a part of larger strategic projects and rapid improvement events. Putting all of the work in one spot makes it easier to capture, implement, measure, and share improvements, in addition to increasing engagement and accelerating your rate of change. Both local and dispersed teams collaborate more effectively when using continuous improvement software, as it increases communication, visibility, and accountability. All tasks and communication are stored in each improvement so that nothing falls through the cracks and no time is wasted in email. 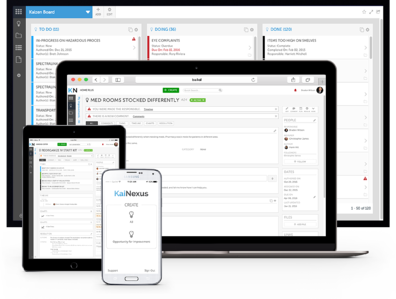 Continuous improvement software makes it possible for dispersed teams to improve together with a single source for all improvement information, synced digital improvement boards, and remote digital Huddles. Local teams benefit from all of this as well as improved face-to-face communication. When trying to sustain a rapid cycle of improvement, it's critical to keep each improvement moving forward. 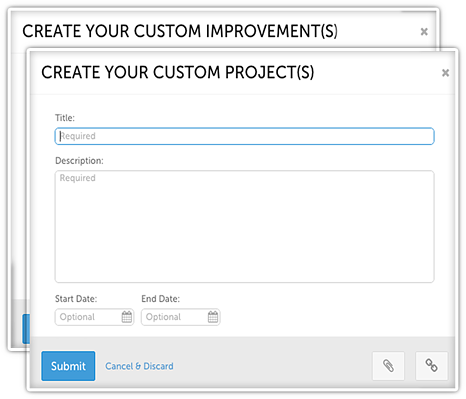 Continuous improvement software sends the right information to the right people at the right time so that everyone stays apprised of what they're supposed to be doing, upcoming due dates, missed deadlines, and team updates. 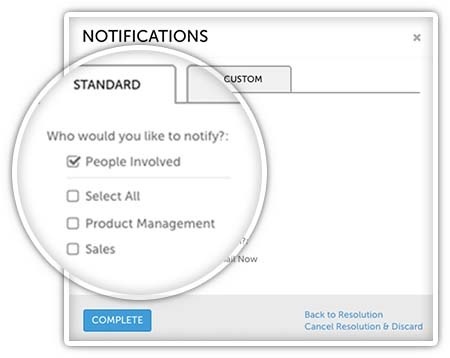 These smart notifications can be customized and are well-timed so that everyone gets the information they need without feeling overloaded. 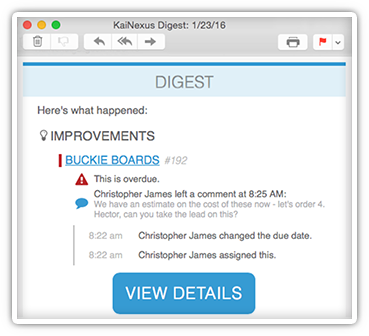 Customizable boards give everyone in your organization a unique view that details what they need to know at any given time. 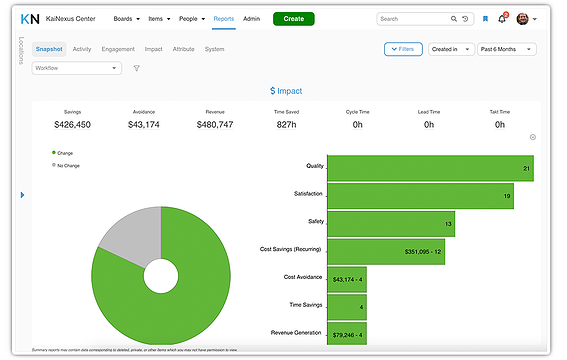 Boards can be as basic as displaying your current improvements and tasks, or as detailed as showing the relationships between projects, events, improvements, and key metrics. 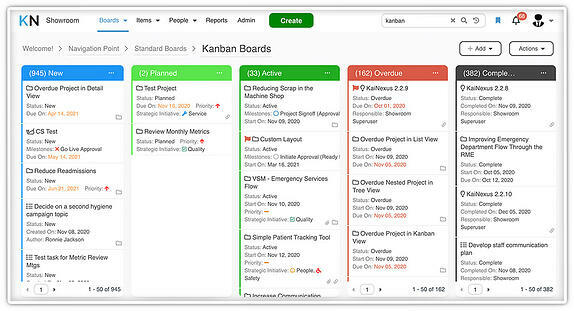 Improvement coaches can view Kaizen boards from across the organization from their desks, using that information to decide what areas they should visit next. With digital boards that update in real time, that are visible from anywhere, and that can be displayed in the same places your physical boards are now, the opportunity for spreading improvement is endless. 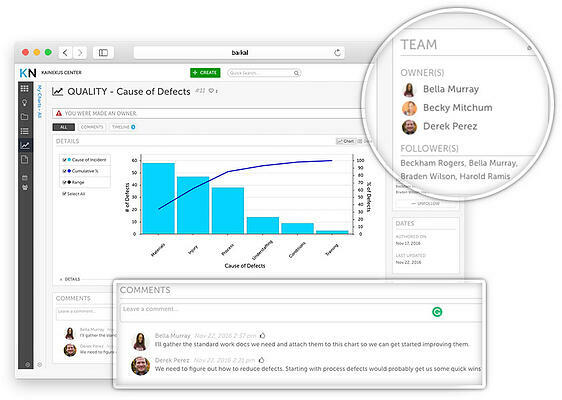 Continuous improvement software lets you track the data you're trying to improve right alongside the improvement work itself so that everyone can see the progress made by the team and the impact on key metrics. 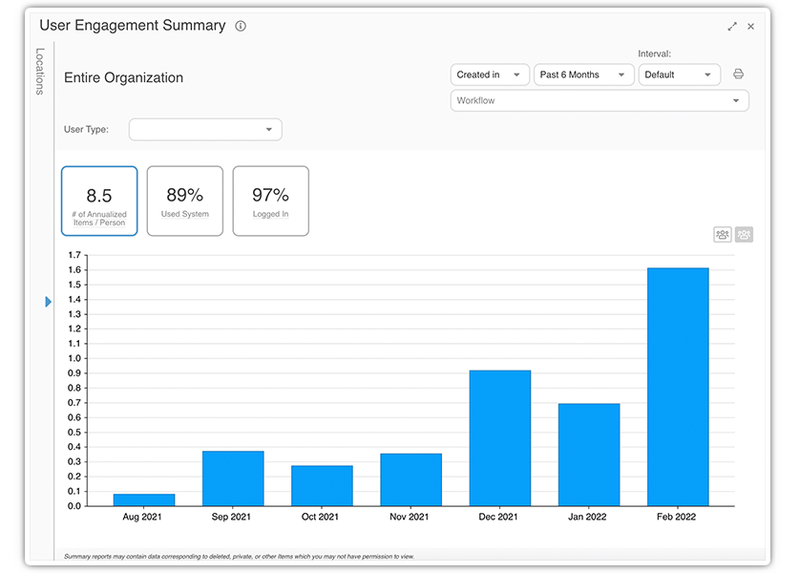 For example, Pareto Charts and Run Charts can be logged with improvements, projects, or as stand-alone metrics. Why not keep track of everything in one spot? Understanding your activity, engagement, and impact metrics is vital to maintaining a healthy improvement culture. With detailed reports that give an overview of the entire organization and drill down to a granular level, it's possible to see what areas are performing well, which need additional coaching, potential bottlenecks to the improvement process, and who deserves recognition for outstanding participation. Calculating these numbers and drawing up reports takes most improvement leaders a significant amount of time. 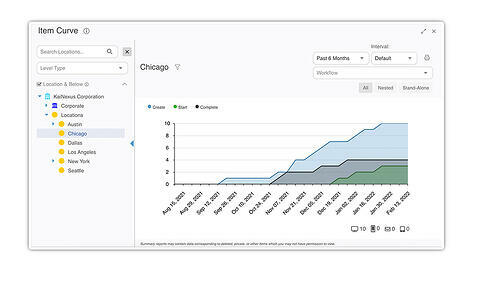 Continuous improvement software tracks all of it for you so that they reports are ready when you need them. 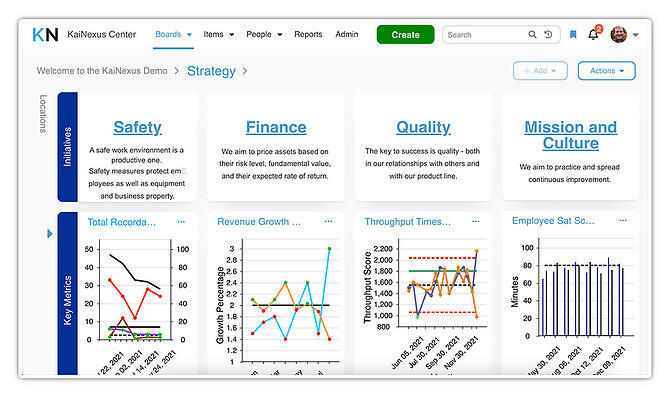 Continuous improvement software creates a permanent knowledge repository that's accessible to everyone in your organization at any time. Before people submit improvements, they're able to do a quick search to find out if someone else has already solved (or is currently solving) their problem so that they don't have to reinvent the wheel. Leaders can use advanced search filters to identify the improvements that matter to them. Continuous improvement software takes the record of improvement that you have hiding in spreadsheets and filing cabinets and puts it out in the light where people can actually find and use it.